Obviously I am on vacation. I will provide a brilliant and pithy review of the 2003 Old Vines when I return. This is a simple grilled shrimp dish that is great as an appetizer, or on a Caesar salad. As I write this I realize that this will work well in quesadillas too, especially if I double the cayenne for a bit more zing. 1 lb. raw peeled shrimp (#30 is a good size), tails left on. Soak 4-5 wooden skewers in warm water while the shrimp is marinating. Whisk the marinade ingredients together. No need to emulsify them, just mix well. Actually I think it would work quite well if you are able to emulsify this marinade, but I haven’t been able to, and it tastes great anyway. Pour the marinade over the shrimp and mix gently. A small bowl is fine, or you can put it all into a Ziploc™ bag and squish them around until they are covered completely with the marinade. Whatever works. Refrigerate for about an hour and then place the shrimp onto the soaked skewers. Pierce the shrimp in two places so they don’t rotate around the skewer and make you nuts when you try, and fail, to flip them on the grill. Preheat the grill for several minutes; the hot grill will leave great looking and tasting grill marks on the shrimp. The hotter the grill, the better the flavor, so use the surface-of-the-sun setting if you have one. Grill, covered, for a 2-3 minutes on each side. Try not to overcook the shrimp. This is the only remotely difficult part of this recipe. If you get distracted by the pretty birds in the backyard, or go inside for another drink, the shrimp will still taste good, but they’ll be a bit rubbery and not as sweet. margarita that goes really well with this dish. Warning: I was tending two giggling thirteen year olds who think that the mall is cooler than Greenwich Village, so this was a meal that I was not able to enjoy at my leisure. After the girls decided that there were no restaurants in the West Village worthy of their presence, I had a moment of inspiration and dragged them east to Momofuku, one of the better known noodle bars in New York. It’s easy to get to, and hard to find. No sign, just a small crowd outside the restaurant, patiently waiting for a seat at the bar. If you go, try to get a seat that allows you a view of the cooks. They are quite relaxed, almost lazy looking, but pump out an amazing quantity of food very quickly. I watched one cook, a cute young woman who seemed to be in charge of the heirloom grape tomato salad. As each order came, she would dress the tomatoes and then taste one to make sure that it was up to her standards. Then (and I loved this) she would chiffonade some shiso and decorate the top of the salad. She also tended the huge stock pot in the corner. And I mean huge! 60 gallons? 80 gallons? Oh, and she was an egg-poaching madwoman! I had a half dozen Barron Point oysters garnished with some minced summer melon to start. I asked the waiter if melon went well with oyster, and his face lighted up in a big smile. 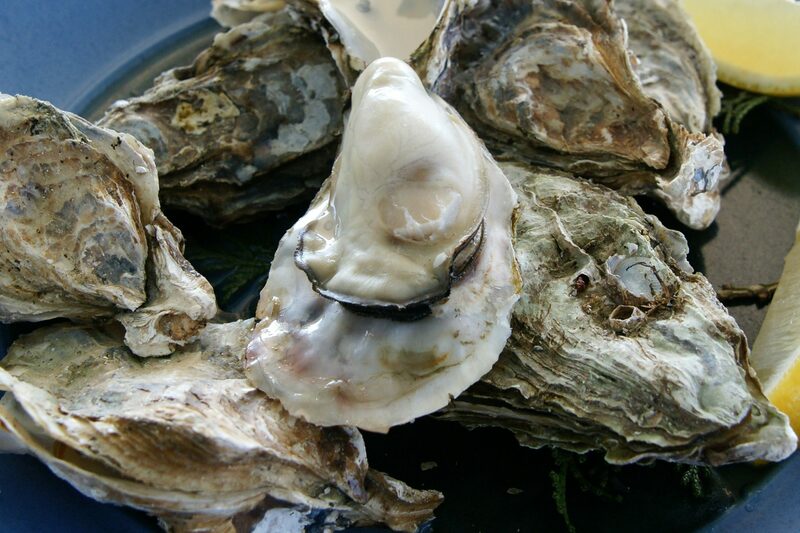 He said that the sweetness of the melon cuts the briny-ness of the oysters. I asked for half with and half without, but since he was absolutely correct about the melon, I felt like a bit of a knucklehead. A weird but fantastic combination. I moved on to the signature dish of the place, a bowl of Momofuku Ramen. If you are afraid of pork fat, do not try this dish. Big slices of Berkshire pork belly on one side, and shredded pork shoulder on the other. And I think I detected some smoke in that pork. In the middle? A lightly poached egg on top of a generous portion of nicely cooked ramen noodles. It was rounded off with some sweet peas and something that must be bamboo shoots but better. Maybe they were pickled, but whatever they were, they tasted great. There was some green onion in there too that added a nice texture. I am probably missing something, but I will definitely go back to check. The girls had the chicken ramen, and that was very good as well, but I just couldn’t resist the pork fat. I had a Hitachino Classic Ale with the ramen, and was not impressed. Maybe the Japanese should stick to cooking and building cars, and leave the beer-making to others. This is serious fast food. Excellent ingredients, well prepared and carefully and artfully presented. Even the waiter knew what he was doing. And fresh chiffonade for each salad? You can’t beat that! It was grueling; two rounds of margaritas in a blind test. Not double-blind, since I was making them and didn’t want to bother trying to hide the Cointreau from myself. I used the same recipe and technique for both rounds, including the same shaker, the same number of ice cubes, and even approximately the same number of shakes! My expert panel was enthusiastic, and even sober (I made sure to do the test at the beginning of the evening). And judging by the stories shared toward the end of the evening, they were all experienced drinkers. The consensus of the tasters was that the Cointreau made a smoother, more balanced margarita. But they all liked the “layers” of taste in the Triple Sec version. The choice was unanimous: Triple Sec! But they also said that both versions were very good. I liked the Cointreau drink, but since my tasting wasn’t blind it is less valuable data. In fairness to the Triple Sec, I think that it made a very nice margarita. I think that the Cointreau‘s extra bit of alcohol and more pronounced orange flavor smooths the tartness of the fresh lime juice. And tasting the Cointreau against the Triple Sec showed clear differences. So, Tommy:Eats is correct, at least for me. But my expert panel thinks otherwise. I haven’t forgotten to test Cointreau against Triple Sec for the perfect margarita, but I have several people coming for dinner this evening and I thought that torturing them would be fun. I’ll report the results soon.And supplicate before Tommy:Eats if I am wrong. I bought a bottle of this Aussie shiraz blend on the recommendation of a friend. Wow! He was right. I have been drinking it over the past few months and it’s getting better and better. This is not a sissy wine. Lots of alcohol balanced by a ton of fruit and licorice and a hint of sweetness (maybe that is a touch of oak) that is not cloying at all. There is a bit of tannin and acid for structure, but the wine is so well balanced that it goes down a bit too well. It is incredibly rich, but because of its balance it is a pleasure to drink, and drink and drink. I am paying for that this morning however. I realize that I am babbling, but this is the kind of wine that will put a spring in your step and a smile on your face. I have tasted a lot of wine over the years and much has been forgettable. Not this one. Oh, I wouldn’t call it a great wine; it doesn’t have the complexity and aging possibilities to be great. On a warm night, sitting outside with good friends, eating grilled pork chops (brined, of course), Caesar salad and molten chocolate cake? Perfect. And for $16 it is a steal. Salt and Pepper to taste, but 1 teaspoon each will work. In a bowl large enough to hold everything, whisk the oil and vinegar together. Drain the beans and rinse gently, then dump into the bowl. Add the rest of the ingredients and correct the seasoning. Refrigerate for a few hours before serving to allow the flavors to blend together. Most beans will work, so whatever you have in your cupboard will most likely be fine. And the more the merrier; as you can see, I have 4 kinds of beans in my 3 bean salad!